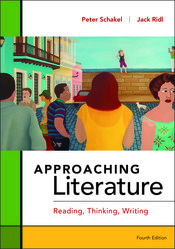 Approaching Literature is a text and anthology designed to engage even reluctant students in the rewarding process of reading, thinking, and writing about literature. Peter Schakel and Jack Ridl aim to use diverse, contemporary literary works as entry points to understanding and appreciating literary classics, and to make the instruction in reading and writing welcoming and accessible to all students, not just potential English majors. With its affordable price as well as its streamlined and supportive approach to reading, thinking, and writing about literature, all students will find something in Approaching Literature that helps them find common ground with the voices of our literary present and past.